1 Josiah was eight years old when he became king, and he reigned in Jerusalem thirty-one years. His mother was Jedidah, the daughter of Adaiah from Bozkath. 2 He did what was pleasing in the Lord’s sight and followed the example of his ancestor David. He did not turn away from doing what was right. This scene has simple lighting from the top left. Eight year old Josiah (son of Zephaniah) is sitting on the throne, holding his mother’s hand. 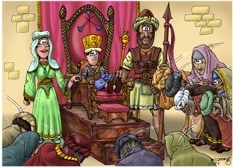 Various court members & nobles are bowing to the newly made king. There is a royal bodyguard (soldier) standing to the right of Josiah, holding a spear with a pennant on it. 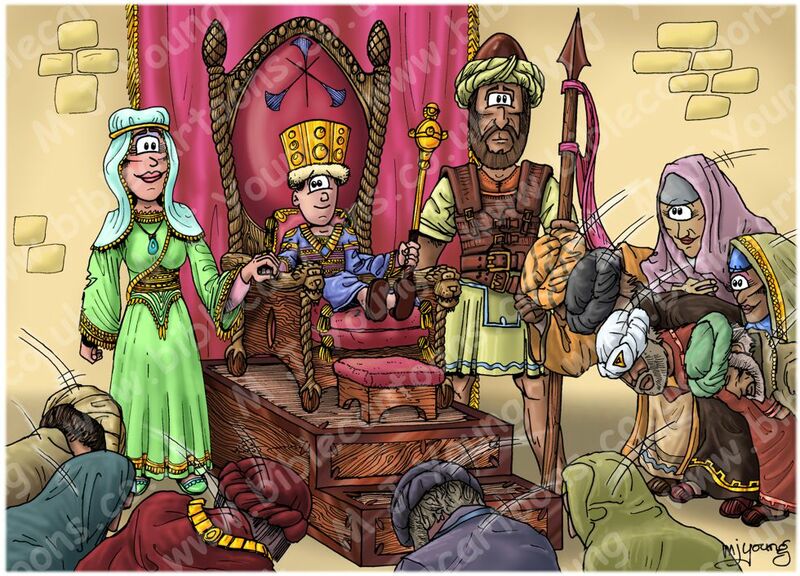 I really enjoyed drawing all the fine clothes in this scene & the ornate royal throne. Many of my characters are dressed in rather plain garb, so it is always nice to be able to design & depict royal robes of splendour for a change! Notice the two lady courtiers or nobles on the right of the scene, who are bowing but sneaking a peek at the boy king!